LHP Jed Bradley enters tonight’s ball game leading Brevard County in strikeouts (29) and tied for the team lead in wins (3). As the 15th overall pick by the Milwaukee Brewers in the 2011 First-Year Player Draft, expectations have always been high for Jed Bradley. After a rocky couple of seasons, it seems as if Bradley has found his groove out on the mound. 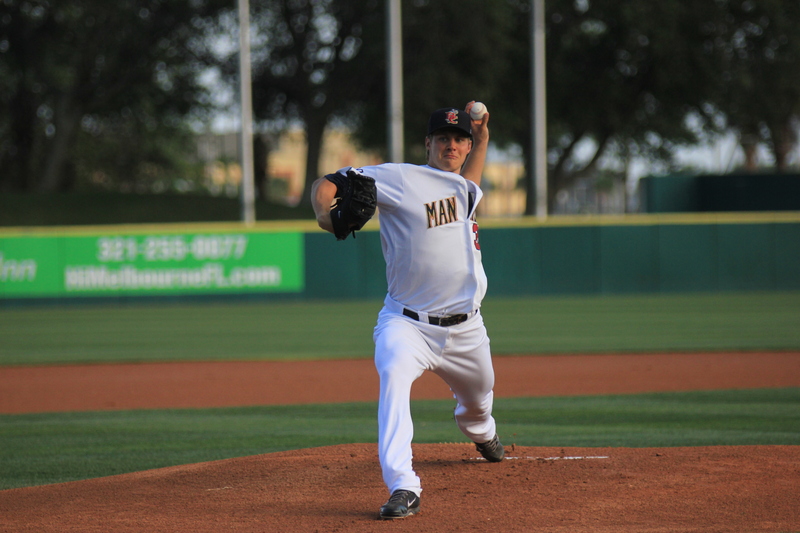 In his first season with the Manatees back in 2012, Bradley did not allow an earned run through his initial three starts, but struggled from there on out. The left-hander finished the season with a 5-10 record and an ERA up over five and a half. 2013 was better for Jed, but there were still plenty of struggles. His ERA came down a full run, but was only able to compile a 4-4 record, surrendering 81 hits over 78.1 innings, in 16 starts before his season was cut short due to injury. However, in his first five starts of 2014, Jed Bradley has been absolutely stellar. Since taking the loss in a rough outing against the Daytona Cubs in his first start of the season, Bradley has put together the best four-game stretch of his professional career. Starting with his April 11 victory at Dunedin, Bradley has gone 3-0 with a 1.22 ERA. The Huntsville, Ala. native has surrendered just three runs, allowing no more than one run in each appearance. As well, Bradley has allowed a career-low fourteen hits over 22 innings of work. Similarly, the former first-round pick has struck out 25 batters, also a career-best for four straight outings, including recording a career-high nine punch outs in a no-decision last night in Daytona. His best night on the bump came on April 16, when he blanked the Lakeland Flying Tigers over six innings en route to the Manatees second 1-0 victory of the season. The performance resulted in being named the Florida State League Pitcher of Week, the first ‘Tee to receive the honor since Brent Suter won it in June of last year. A big key to Bradley’s success during this time frame has been his ability to retire the lead-off man. Since his loss to Daytona on April 5, Bradley has allowed just three of 22 lead-off batters (.095 batting average) to reach base on two singles and a walk. Even more impressive, only one of those players have come across to score a run, with the other two being retired trying to steal. With the Brewers Double-A affiliate, the Huntsville Stars, slated to move out of state to Biloxi, Miss. next season, Bradley looks determined to get a chance to make his home starts right where he grew up. If the left-hander continues to pitch the way he has over the first month of the season, he’ll get that opportunity sooner rather than later.